Here's a list of Skills for all full 5 Stars Dark Element Heroes in Bloodline: The Last Royal Vampire mobile game. If you want to know the new skill set of your 5* heroes after evolving them from 4*, or if you are looking for a nice Dark Hero to add to your team, then you may refer here for information. - Sonic Blast III: Use the power of curses to deal moderate Dark Element damage to all enemies. - Demon Blood IV: Hero Aura: Blade Ron COST requirement is reduced by 5 points while ULT Skill damage is increased by 10%. - EXP Up III: All party members receive 50% more EXP post-battle. How to Obtain: Redeemed from Task Collections, or Evolve Classic Ron 4*/5*: Get by evolving lower versions of Ron. - Fang Attack III: Severe Dark Element damage to a single enemy, with a good chance to poison the enemy. - Death Cupid III: The anger in Ivy's heart is ignited, causing 25% more damage to male targets. - Ivy's Kiss III: All party members are immune to poison and receive 15% less damage. How to Obtain: Crystal Trade or Fragment Trade x200: Get from Arena Honor Trade. - Evolve Shadow Ivy 4*/5*: Get from Crystal Trade. - Evolve Spider Ivy 3*/5*: Get from Crystal Trade or Fragment Trade x30: Farm from Arena Honor Trade. - Death Blade III: 3 rounds of moderate Dark Element damage to a single enemy, with a chance to lower enemy healing rate by 50%. - Death Knight III: Seth, with a knight's instinct from his previous life, causes greater damage the longer the charge distance; life is increased by 10% if he is in the same squad as Death Knight. - Dark Fury III: All Dark Element party members cause 50% more damage. How to Obtain: Gem Summon or Crystal Trade. - Evolve Knight Seth 4*/5*: Get from Gem Summon or Crystal Trade. - Evolve Dark Seth 3*/5*: Get from Gem Summon, Crystal Trade, or Fragment Trade x30: Farm from Challenge Mode > Chapter 5 War of Red Door > Heaven Army. - Soul Ripper III: Activate Soul Harvest Formation, dealing moderate Dark Element damage to all enemies with a small chance to curse your opponent. - Soul Harvest III: Hell Messenger regains 20% HP with every soul harvested, and damage caused in the next round is increased by 20%. - Death Trick III: All enemies cause 15% more damage, but their DEF and REC stats are reduced by 30%. - Evolve Death Knight 4*/5*: Get from Gem Summon or Crystal Trade. - Evolve Reaper 3*/5*: Get from Gem Summon, Crystal Trade, or Fragment Trade x30: Farm from Guild Shop. - Apocalypse III: Perform 5 consecutive stabs at an enemy with Shadow Spear, dealing minor Dark Element damage. - Fallen Power III: Mika gains the power of darkness, giving a 20% chance to trigger CRI hit for the next attack with every attack. - Charge Slam III: All party members receive 100% increase in CRI hit damage. 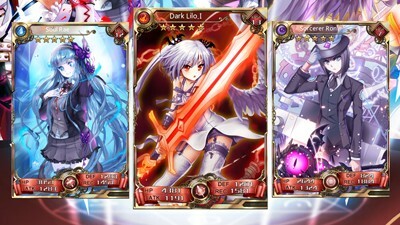 - Evolve Dark Angel Mika 4*/5*: Get from Gem Summon or Crystal Trade. - Evolve Fallen Mika 3*/5*: Get from Gem Summon, Crystal Trade, or Fragment Trade x30: Farm from Guild Shop. - Fool Page: Last transforms the battle environment into the Royal Vampire Domain, dealing moderate Dark Element damage to all enemies. - 12th Elder: 30% of damage to the last Royal Vampire Elder transforms to healing if HP level is 50% at start of round. - Royal Legacy: Damage from all party members is increased by 30%, with 10% transformed into healing for players. How to Obtain: Fragment Trade x200: Farmed from Plains Invasion Event Rewards. - Grim Avarice: The Blood Messenger summons Death Knight from another dimension for a combined hit, dealing moderate Dark Element damage to all enemies. - Reaper Hold: Summons Reaper Hold, with damage dealt increasing by 5% and DEF lower by 5% after every ATK; may be stacked for a MAX of 10 times. - Shadow Touch: If the party member with the least HP is an Assassin, he/she will heal by 20% and damage will be increased by 200%. How to Obtain: Fragment Trade x200: Can not be farmed yet. - Ruin Song: Eunice shoots dark energy arrows at the sky, dealing moderate damage to all enemies. - 9th Elder: The whole Squad receives Eunice's Blessings, which heals them gradually after attaining full Fury. - Magic Arrows: Damage increases exponentially with the range of attacks for all Archers in Squad. How to Obtain: This Hero can not be obtained yet. - Twinblade: A triple strike that deals massive Dark damage to a single enemy. - 2nd Elder: Damage dealt and damage reduction doubles after becoming War God/Life Drinker. Immune from Job Change side effects. - War Control: Damage, DEF and REC rates of all Warriors in the Squad are increased by 30%. - Gem Summons: Chance to get 3, 4, or 5 Star Heroes. - Crystal Trade (Divine House): You can trade your Crystals here to get 3, 4 or 5 Star Heroes/Duplicates. The locked Heroes will become available if the Hero is present from your Hero Memoirs. Featured 5 Star Hero is based from the available event. - Evolving Heroes: Basically, you can get them by evolving their lower versions up. - Fragment Trade: After farming the required number of Fragments, trade them in the Divine House to get the Hero. Note that some will require 3*/5* or full 5* Hero Fragments. - Vampire Sanctuary: Can obtain random Hero fragments from chests, with a chance to receive a full Hero. Hero Fragments can be farmed too from Mysterious dungeon encounters. - Airship Merchant: Check and buy Hero Fragments here if you want, best done if you just need a few pieces to complete the Hero. Note that you can get almost all heroes here, including event only heroes. - Event Based: Other sources like Sign-in rewards, Task Collections, Limited Events, VIP exclusive rewards, and more.